With design-driven hotels, epic surf breaks, seaside music festivals, and a bold local food scene, Barbados is unbeatable. Forget having a destination wedding, have a vacation wedding you and your guests will never forget! With design-driven hotels, epic surf breaks, seaside music festivals, and a bold local food scene, Barbados is unbeatable. Forget having a destination wedding, have a vacation wedding you and your guests will never forget. There are very few islands where you have such a wide variety of wedding venues. Unlike Mexico, the Bahamas, or Jamaica, Barbados just isn't an island where you find commercial all-inclusive brands. Likewise, you're not bound to pricey places like Four Seasons, One&Only, or Rosewood Resorts if you're looking for something more lavish. In fact, these island institutions don't even exist on Barbados. Instead, Barbados's lodging landscape is dominated by independent properties, many of which are Barbadian owned and operated. So, fear not that you'll have a cookie cutter Caribbean wedding cut from the cliche Sandals cloth. A Barbados wedding can be truly bespoke. All of the following venues offer comprehensive wedding packages and planners that even encompass logistical elements such as transportation to the licensing office, services of a Minister or magistrate, and menu curation. So, while your wedding won't be cookie cutter it can still be turnkey. There are also very few islands that are as easy and safe to navigate as Barbados. This makes it very easy for your wedding guests to explore the island at leisure and creates opportunities to diversify your wedding events. Feel free to plan brunches, dinners, parties, and group activities across the island! Buses: Barbados has a fantastic public bus system that serves the island's every beach and boulevard. Each one way ride is $2 Barbados Dollars (the equivalent of US$1) and routes are extremely easy to navigate. 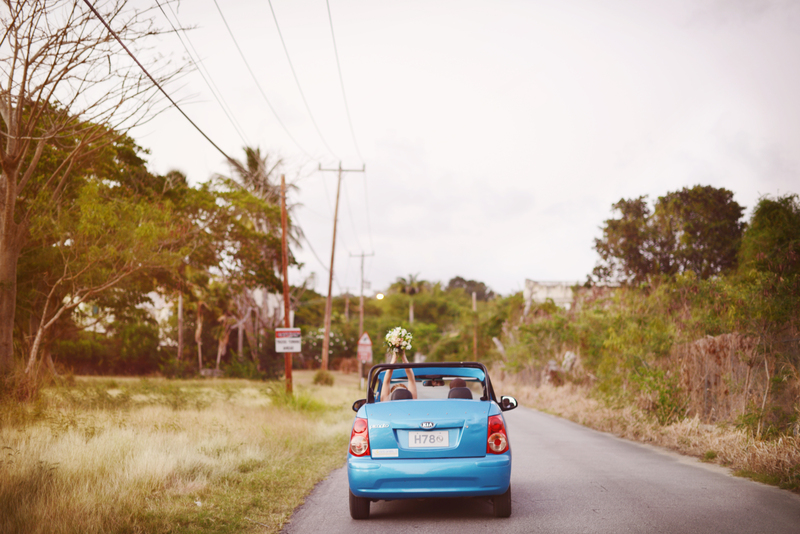 Rental Car: Barbados's roads are all well-paved and well-marked, so guests can rent cars and autonomously travel the island. A classic choice is the "moke", a small SUV with no doors or roof, and Stoutes Car Rental offers discounted group rates for wedding parties. Mokes also make for a colourful and completely adorable "Just Married" photoshoot. Taxis: Taxis are quite expensive in Barbados, however their cost is easily cut by riding in a group. Most of the taxis are minicoach vehicles that fit 10-15 people, and destination wedding guests generally travel as a troop, meaning the price per person comes out to no more than a few dollars. 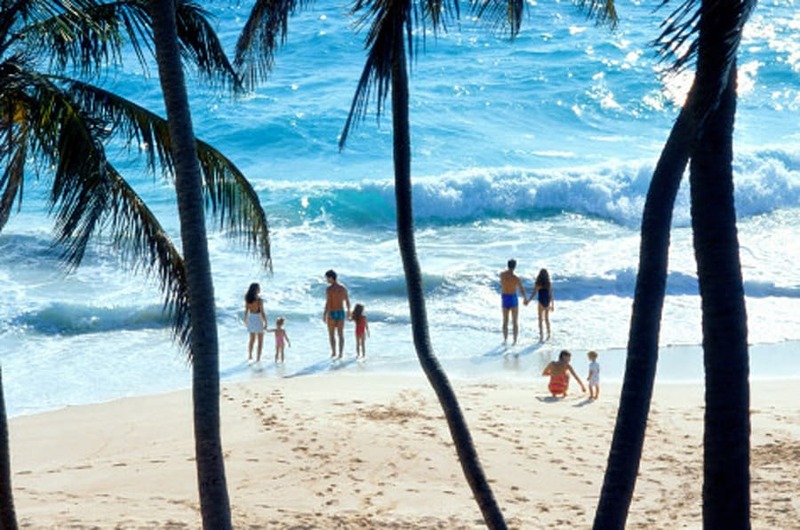 Surfing: A surf lesson is a must during any visit to Barbados. Because the island is entirely enveloped in reefs, there are guaranteed good surf conditions almost every day of the year. Boosy's Surf School offers personalized group lesson packages. Swimming with Sea Turtles: This is another must. Book a group snorkelling trip with Barbados Blue, which is located beside the densest Hawksbill Turtle nesting site in the eastern Caribbean! Catamaran Cruise: Spending the afternoon aboard a luxury catamaran is an exciting and memorable way to celebrate - and suntan - as a group. Seaduced organizes sailing trips along the island's tranquil west coast (complete with unlimited champagne and rum punch). Distillery Tours: Barbados is the birthplace of rum, so a trip to the island isn't complete without a visit to a distillery or few. Barbados's Mount Gay Rum is the oldest brand of rum in existence and the distillery is open for group tours and tastings six days a week. Festivals: Barbados has a teeming cultural calendar, with unique events that can be integrated into wedding festivities. Crop Over is Barbados's annual Carnival, and is a bucket list item in and of itself. In the spring is Reggae On The Hill, the biggest international reggae event outside of Jamaica. Come autumn, there is the internationally renowned Barbados Food, Wine, & Rum Festival. Nightlife: There are several beach clubs that are perfect for pre-wedding parties. 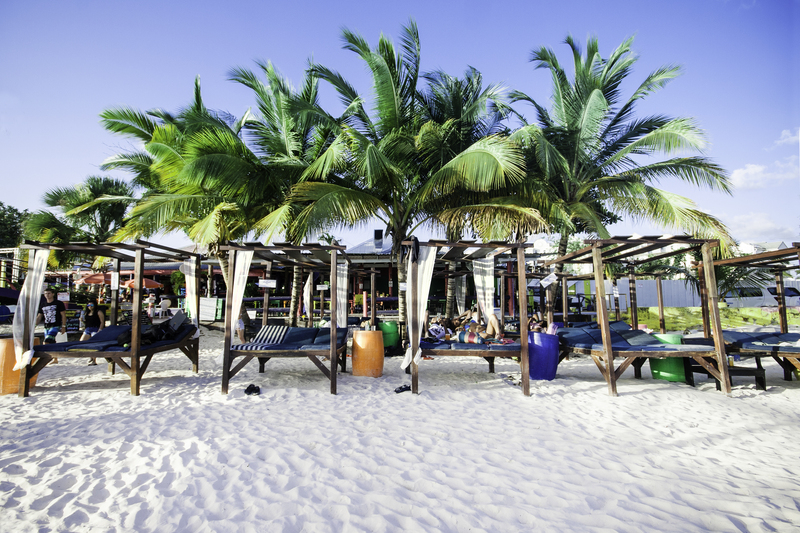 Check out the Boatyard for daytime beach time and Harbour Lights for a Thursday or Friday night welcome bash. Forget having a destination wedding where guests have to eat all of their meals - from the Welcome Dinner through the Farewell Brunch - in the same hotel restaurant. On a trip to Barbados, you could dine at a different restaurant for each meal and still not hit every must-try establishment on the island! The easiest way to make sense of the local food scene is by coast. The west coast, known as the 'Platinum Coast', is where you'll find upscale (and very pricey) fingers-crossed-you-can-get-a-reservation restaurants like The Cliff, a popular choice for rehearsal dinners and wedding receptions. The Cliff, as the name suggests, is situated on the scenic edge of a coral cove, and is perhaps the most revered restaurant on the island. The menu is known for both its surf and turf: delicate dishes such as truffled beef carpaccio and roast Gressingham duck breast. Additional west coast winners: The Fish Pot, Scarlet, and a boozy lunch (plus Rum Sours) at the Lone Star hotel restaurant. If you're staying at a vacation rental or villa and like to cook, then pick up ingredients at the Holders House Farmers Market. The south coast is far more casual, and the standout is Oistins, a fishing town that hosts a fish "fry" every night. I say "fry" because it is really a fish barbecue, with food stalls like Pat's Place dishing up enormous portions of grilled "dolphin" (the local name for mahi-mahi), tuna, swordfish, red snapper, and marlin, plus sides of macaroni pie, cole slaw, and fried plantain. A plate of food and a cold Banks beer runs about CAD$20 per person, making Oistins a cheap and cheerful place for a group meal. Additional south coast winners: Cuz's Fish Shack on Carlisle Bay (near Bridgetown and The Boatyard) makes the best sandwich on the island. Period. Lastly, there is the east coast. Because Barbados is such a cosmopolitan island, it can be surprisingly difficult to find restaurants that serve authentic Bajan cuisine. But east coast establishments such as Lemon Arbour and the Atlantis Hotel have visitors covered. Lemon Arbour serves some of the best local cuisine, including 'souse' (lime-pickled pork), 'cou-cou' (cornmeal and okra porridge, similar to grits), and macaroni pie. It is open throughout the week but Saturday afternoon is the best time to go as they have their weekly "lime", Bajan parlance for "party". On Sundays, the Atlantis Hotel has a phenomenal Bajan buffet brunch - known as the best brunch on the island - and for those who have a Saturday night wedding, this is a fantastic option for a recovery meal. Feast on island classics such as salt fish, yam gratin, bake (a traditional West Indian bread), flying fish, breadfruit, golden apple juice, and much, much more. Finally, on the way to the airport, guests can hit Cutters, for a goodbye glass of what is widely said to be the best rum punch on the island. Cutters also sells bottles of this glorious elixir, which makes the perfect welcome gift for guests. From the beach to the wedding bash, brides and their maids can deck themselves out in fly Bajan fashion. Look no further than local designers Suga Apple Swim and Pink Lemonade for bathers, coverups, and bridesmaids dresses. Accommodation: Guests are not limited to staying at a hotel. There are hundreds of Airbnb properties for rent or if you prefer to work with a property manager, Blue Sky Luxury has an array of affordable rental properties across the island.